Kate Middleton vs. Princess Di: Who Ranks Higher on the Pretty Princess Scale? I like Kate Middleton. She seems normal, chill -- hell, she might do her own wedding makeup! -- and she's really fun to look at. With her legs for days, locks of flowing raven hair, and flawless skin, it's safe to say the girl's attractive. And apparently the people agree! In a recent poll by BeautifulPeople.com, she was voted the third most beautiful royal in history, beating out Princess Diana, who came in fourth. And in case you're wondering -- and you're up on your royal ladies -- yes, Princess Grace (Grace Kelly) was number one, and Queen Raina of Jordan was number two. I think the world is breathing a sigh of relief that the British monarchy can only get better looking in generations to come. He doesn't think Kate is classically beautiful. Kate Middleton is no typical beauty. But her style, deportment, and immaculate grooming have clearly won her an army of admirers, propelling her to the same heights as Princess Grace and Queen Rania. Her immaculate grooming? What? Does she, like, do a really good job brushing her teeth and waxing her eyebrows or something? Does she put on lipstick like no other? I'm confused. Am I crazy? Or is Kate, like, super pretty? I mean, I don't think she's Grace Kelly pretty, but homegirl is hot. I don't know what you're talking about, Mr. Hodge. However, after poring over the photos for longer than I should have a few minutes, I'm kind of in disagreement over Princess Madeline of Sweden's spot on the list. She's a bombshell! She totally should be higher up than number seven. Whack. And actually, while I'm doing a little rearranging, I also think Princess Charlotte of Monaco should be higher on the list. Way higher. Like, ahead of Kate higher. She looks like Angelina Jolie for pete's sake! That is not the face of a fifth-ranked princess, my friends. She is at least a number three. Perhaps she needs to work on her hair brushing or something. Whatevs. All the princess on the list are incredibly beautiful. And they're princesses! Life's a-okay for them. I'm just a little upset they left off Princess Toadstool. She's so political. 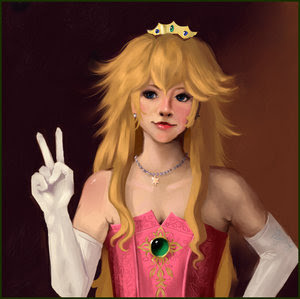 Who do you think is the prettiest princess in all the land? What do you think of Kate Middleton?